While total renovation is a few years off, we’ve been working away at regenerating the stone house on Main Street since we bought it in 2009. 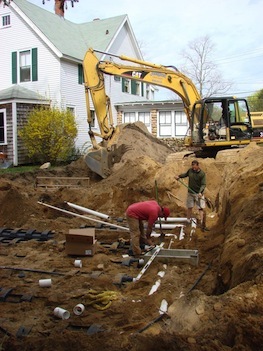 The first year, we worked with the excellent people at South Mountain to stabilise the house and put in essential services like the new septic system, underground electric and telephone supply cables and a new electric panel. In the years since, almost all of the windows have been cleaned, repaired and treated with linseed oil paint. Many of the original house floors have been stripped back to the attractive bare wood of the boards. We’ve plumbed in a dishwasher and added an outdoor shower (which has been much enjoyed by all). We’ve also added a washing machine and dryer. The many layers of roofing on the stone part of the house were stripped off and a new roof put on, along with a new front door and front door lintel. The two chimneys, which were in a very poor state, have been taken down below roof level and will eventually be removed entirely and the bricks used to extend the back terrace. We’ve tamed the privet hedge on the north side of the property – which like all privet requires regular trimming to thicken it up and keep it that way. A native shrub border (including high bush blueberries) has been added on the south side, along with a day lily border along the stone bedroom wall. Architectural plans have been drawn up by local architects Sullivan O’Connor who have mapped out the entire building from roof to basement so we can begin to understand the historic structure and work out ways of keeping as much of the building’s original fabric while making it work as a 21st century ‘green’ building.